Fixed wireless access (FWA) is a proven alternative access technology for residential and enterprise broadband services. With widely available LTE technology, unlicensed spectrum options, and 5G, FWA helps bridge the last mile, enable broadband services in geographically dispersed areas, and provide a temporary solution to grab customers while CSPs roll fiber. 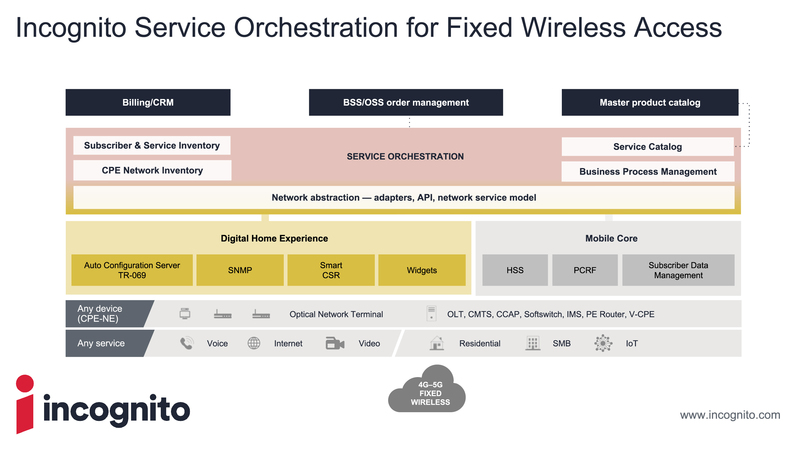 Remote device management to support customer care and home users is a key imperative for fixed wireless access providers to differentiate the customer experience, reduce OPEX, and expand broadband services. Whether you are enhancing an existing fixed wireless network with device management, or a new 4G LTE or 5G greenfield opportunity, you need a partner with proven credentials in residential broadband service and device management. Incognito offers proven service orchestration solutions and fixed wireless experience to get you there faster. We are the industry’s leading device and service management software specialist for in-home broadband, in production with global providers, like Globe and other Tier 1 providers in Latin America and Europe. With Incognito service orchestration, you can offer a great digital home experience over fixed wireless technology, and reduce operational costs through process automation and digital channels. To improve the quality of experience for LTE fixed wireless residential customers, a Tier 1 European galaxy service provider required an innovative solution for two affiliate markets to remotely manage devices on the customer premises, and quickly resolve technical issues. The Incognito Digital Home Experience Solution empowered this service provider with extensive analytic and diagnostic capabilities to proactively and remotely manage devices serving the in-home network, reduce CPE device swap rate, and gain business intelligence from device and WAN analytics to drive network planning. A critical element of their digital transformation strategy, a Tier 1 service provider in Asia needed to address the rising cost of technical support calls into customer care, and increased truck rolls. This service provider needed a multi-access technology solution to support residential services over DSL, fiber, and LTE fixed wireless access. To shrink the average handle time for customer support calls related to home network issues and improve quality of experience, the operator wanted to automate and digitize the interactions between call center agents and home broadband users. By leveraging the Incognito Digital Home Experience Solution, the service provider was able to reduce CSR call handling times by 30% and reduce truck rolls by 50%. The increase in successful first-time call resolutions by customer care also contributed to higher customer satisfaction. This Tier 1 service provider in South America was offering residential broadband services over LTE fixed wireless access. Their top broadband cancellation reason was poor signal quality and strength over the LTE service. They were also dealing with challenges around location of the device within the customer premises with heavy reliance on field technicians and truck rolls to address these challenges. The Incognito Digital Home Experience Solution provided a common platform to manage all residential CPE, including LTE fixed wireless devices, with KPI reporting to identify issues, and integration to the customer care portal to allow CSRs to troubleshoot device issues and improve the in-home experience, while reducing truck rolls.